Dramatically applied overglaze green enamel decoration is a major characteristic of this style. 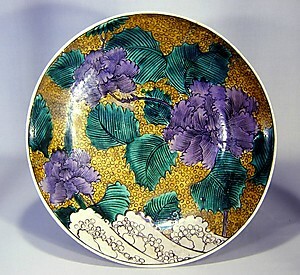 In addition, Kutani ware pictured by the technique of nuriume to paint over the entire surface with overglaze brilliant enamels leaving no white space is another characteristic of Aote. The attraction of this style are its bold designs expressed with bright coloration by nuriume to decorate the entire surface and the application of rich colors.